The questions posed anytime you first meet an artist have to do largely with trying to figure out what type of artist they’re going to shape up to be. What can you expect from them, in other words. So we do some rough assessments starting with what style of music do they fall under, what kind of approach do they prefer, where do their strengths lay and what are their weaknesses? Do they play an instrument and how well? Is their voice going to be a benefit or a hindrance? Do they write their own songs and are those songs any good? We can’t get all those answers on first listen obviously but we can usually get a pretty good handle on their prospects if nothing else. With more releases we get more information and they begin to take shape. 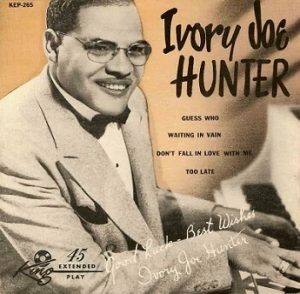 In the case of Ivory Joe Hunter we had advance notice as to his attributes as he’d been cutting records, including a decent sized hit, in the years prior to signing with King Records in late 1947. He was versatile, that much we knew and we assume King’s Syd Nathan was counting on that adaptability to position him in whichever field seemed most commercially promising. Cocktail blues? He could do that. Jazz maybe? Sure, he was accustomed to playing with some of the best jazz musicians on the scene. More of downhome bluesier material perhaps? Yeah, he could pull that off as well, reaching back to his days a barrelhouse pianist. Or how about this newfangled hybrid style of rock ‘n’ roll, which barely was out of the womb by that point but which seemed to encompass a wide array of influences that he was familiar with. That might be the best bet to make headway in it should that genre coalesce into something marketable. Truthfully he could’ve succeeded in any of them, so the real question might be what style did Hunter himself have in mind? A year and a half later we’re no closer to an answer. Quite possibly we’re further away from one than ever. So just who was Ivory Joe Hunter the artist? Well first and foremost he was a prolific songwriter, somebody who over the course of his life would pen thousands of tunes. Considering his prolific output in this regard it’s likely that he viewed this as the skill he took the most satisfaction in, even more so than recording and performing. Perhaps because of that Hunter was constantly trying different styles, like a scientist more at home in a lab where he could conduct experiments, constantly tweaking formulas and eagerly anticipating the results. Before the test tubes had even stopped overflowing he’d move on to something else. But like the scholarly image of a scientist can obscure a more well-rounded persona, Hunter too was pigeon-holed by his success as a balladeer. Although he tried his hand at all sorts of tempos with some success over the years his ballads generally drew the most attention, as they gave introspective lyrics a perfect setting to be conveyed by his honey-toned voice. While that style is certainly an important part of rock it has a tendency to call into question his authenticity as a rocker in the eyes of many once the ballad to uptempo quotient rises. With this release Hunter does his reputation as a potential rocker no favors, in fact it probably only adds more questions. As to the most pressing of those – just who was Ivory Joe Hunter shaping up to be as an artist – the only reply that might possibly explain anything is to say he was an iconoclast, a man not about to conform to expectations for the sake of cultivating a specific audience and keeping them happy. Yet he managed just to do just that and keep listeners coming back for more in spite of his constantly veering direction and with Waiting in Vain he scored his fourth hit – and his biggest to date – on King Records. Yet it’s a song that could reasonably be claimed by multiple genres and it’s probably only Hunter’s long term association with rock that gets him a pass to qualify under that heading. But the thing about it is, Hunter probably couldn’t have cared less where it was housed, just as long as you heard it and appreciated it for the very real charms it offered. It was the last day of February 1949 when Hunter’s band convened in Los Angeles. They haven’t cut a record since December 1947 but the time away from the confines of the studio has done them well. They were hardly big names then or now, especially compared to some of the legendary musicians he’d previously cut records with or some of the session aces he’d work with in the future, yet this more anonymous group who backed Hunter on the road during that time were reputedly among the tightest self-contained units to be found on the scene. His comfort level with them is fairly evident as he gives them something that might otherwise have a tendency to be overplayed by most musicians yet trusting they’ll rein themselves in. They do just that, handling the track like the delicate composition it is, letting the focus fall on Hunter who shows how lovingly Waiting In Vain was crafted. We’ve talked about Hunter’s songwriting skills at length here and tried to explain how highly regarded he was as a lyricist even though many, if not most, of the songs we’ve covered to date had rather banal lyrics. The thinking has been to this point that he was SO fertile with ideas that he rushed them to completion, using them almost as fully produced demos that happened to see release when the recording ban rendered any re-workings or just fine-tuning impossible. Now, with fourteen months to intricately work out every detail of each idea he had, he’s going to start to hit his stride in that sense, coming up with much more polished compositions left and right, songs that will endure, modern standards if you will, capable of being cut by all types of artists in any era and of any background. Still we DO need to address head on the incongruity of a rock artist surrounded by such elegance. No matter how open minded we are in our designations the crying trumpet and weeping strings send us recoiling in shock, even dismay, as if Ivory Joe has finally given in to his mainstream demons and is aiming squarely at the pop realm to take his place alongside Billy Eckstine and Nat “King” Cole as black balladeers who unambiguously aligned themselves with the “other” side during this era. On the surface it’s hard to claim that wasn’t what Hunter was doing here. The year long layoff has certainly shown what direction rock as a whole was heading in – and proven that it was commercially potent enough to pursue – and this definitely wasn’t a clear unambiguous statement of intent to join that party. Quite the contrary actually. In fact this would appear to be a clear move away from that – and away from us – and therefore reason to dismiss, or at least seriously downgrade, him for these actions. To be fair about it we’ve certainly castigated the likes of The Ravens and Orioles for their open courting of pop respectability, why should Hunter be any different? I can’t really answer that one either, other than to say that he does this SO well that you’re caught off guard almost. He pulls the emotional strings required for you to give him a pass on his intent with such a deft touch that you don’t realize that you’ve relaxed your standards of inclusion until it’s too late. By then he’s sucked you in. In past reviews one of Hunter’s shortcomings was the levity of his deliveries at times, the inability to connect the lyrics with the appropriate mood required to sell those lyrics. He was either “too nice a guy” when spitting put-downs over a love gone wrong, or not exuberant enough to fully convince you of the joyfulness expressed in other songs. On Waiting In Vain he has no such problems. Though certainly helped by the mournful, slow-as-molasses accompaniment, Hunter even lags behind them for much of this, as if the lump in his throat over his sorrow presents an almost insurmountable obstacle to get the words out. As such he has time to ruminate over their meaning even more as he works up the courage to voice them and share his grief with the world. The sadness is palpable in every word he sings. This is no mere recitation, he’s actually living these sentiments as he goes on, as the catch in his voice on the word “cry” makes abundantly clear. He’s either an unparalleled actor worthy of the Broadway stage or his heart was literally breaking as he sung this on the studio floor, probably with the lights turned off so his tears couldn’t be seen. But no amount of darkness could hide them from our view when we listen to his melancholy voice tearing at our heartstrings. After another slight catch on the word “lie” the mood shifts ever so slightly, the story going from recounting the events that caused his suffering to the more existential questions their parting raises, asked with just a hint of indignation that he summons to mask the depth of his heartbreak. Vocally he’s never sounded better and while this is hardly the setting we normally appreciate there’s nothing about the choices he makes to call into question. The delicate melody, the halting pace, the hazy images the violins conjure up, as if this is being viewed in shadowy black & white further shrouded in mist, all contribute to this as a mood piece of surprising tenderness. By the end – and the closing refrain is as exquisitely delivered as could be – the mastery of his performance becomes perfectly clear and explains why he didn’t merely turn to being a contracted songwriter as someone with his talents and, let’s face it, his relative lack of matinée idol looks, flamboyant persona or all consuming craving of the spotlight would presumably be more suited for. In this era especially, when it was the songwriter more than the artist whose work was celebrated by the industry, who were talked about in reverential terms and whose names it was believed would live on far beyond whatever singers gave voice to their creations. Hunter, more than any name associated with rock at this point, was somebody who not only was capable of joining their illustrious ranks, but also seemed with his diverse repertoire to be aspiring to such a lofty position. But had he done so, had Ivory Joe sat in a cubicle somewhere on Tin Pan Alley punching the clock while writing songs, then he himself would never get to test them out, to see how effective they could be in the way he envisioned it rather than some stuffy producer or headstrong artist who felt they knew best how to deliver emotions as vulnerable and poignant as these. No, in a rock survey Waiting In Vain wouldn’t belong had Hunter not eventually returned to more suitable material for our needs and got this in the back door by association, and because of that the song itself can’t be judged as if the context we’re assessing it for no longer matters. It does matter and as such it will be downgraded accordingly, reluctantly, but necessarily. But as a statement of his talents, of his ambition, of his commitment to his artistry, Waiting In Vain transcends the limitations of one genre and its stylistic boundaries and stands as something worth admiring, even if we’re forced to do so from afar. Man, rating this one must’ve been difficult. I tried, but I just can’t do it to my satisfaction. At one point, I thought to myself that the Beatles made songs as genteel as “Yesterday” and “In My Life,” but no one thought they were going to switch to pop. But, I then figured that rock-and-roll was the dominant form of popular music by the mid-60s, so of course no one thought the Beatles were going to switch genres. In contrast, Ivory Joe was operating during the height of the Black Pop Balladeer era. It’d be natural for any rock fan during the late 40s to assume Joe was leaving for greener pastures (he certainly had the artistic goods to do it). For that reason, you’ve probably got to dock him. The problem is that this might be the loveliest song you’ve covered thus far. I’m torn. I was torn too. In a survey of all music, regardless of style, in 1949 this might’ve gotten a 9 but in the realm of rock ‘n’ roll it’s on uneasy footing. The all-important question of how it contributes to rock as a whole going forward… IE. is this the direction that rock itself would benefit from if others followed… means it did have to get penalized a bit. Yet I didn’t want to downgrade it too much because it is so well done and a perfect example of Hunter’s skill set. This is always why I hope readers don’t just skim the review to get to the Score, which to me is the least important and most frivolous aspect of the entire project (though admittedly enjoyable and possibly helpful). Leave a reply on "Ivory Joe Hunter: “Waiting In Vain”"